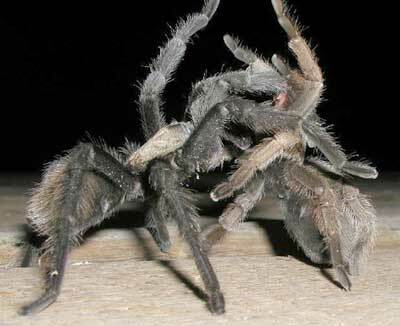 Tarantulas, according to a 2013 review in the journal Arachnology, are the largest and longest living spiders in the world. Nelson Ferretti, a tarantula expert with the the National Scientific and Technical Research Council in Argentina and lead author of the review says there are nearly a thousand species alive today, and most mate in the spring and summer; although some species are known to mate only in the winter. According to the study co-author Fernando Pérez-Miles, an entomologist at the National Autonomous University of Mexico, after male spiders are born and travel into the adult stage of their lives, they insert their two pedipalps or the small appendages near the front of their head with sperm. Although the insertion of the sperm is time and energy consuming, males can usually mate with multiple females with just one insertion..
During the mating season, “charged” males, or males who have gone through the insertion process, will leave the nest, so to speak, in order to find approachable females. The male tarantulas will focus on the female’s pheromones, or chemical scents, though “it’s unclear if only receptive females produce male-attracting pheromones.” When a male discovers a “connection” or a female that has the appropriate pheromones, the male and female with mate. If the female enjoys the feeling, she will respond by tapping her front legs, letting him know that she wants him, and to direct him toward her burrow. However, in other species, the female will move towards the male instead, leaving her burrow behind. When the time has come, the pair will come face-to-face, showing and elevating their bodies and front legs to each other. In other species, the tradition is different. The male will initiate spasmodic beats on the female with his second pair of legs, which is thought to put the female at ease and relax her fangs. In most species, the males have specialized spurs that can clasp onto the female’s fangs which elevate them into the correct immobilizing positions and to prevent bites. Once the pair are ready, the male will place his charged pedipalps into the female’s genital opening, one to five time. When he is finished, he will leave to find other mates, that is, if he’s “lucky enough to avoid getting eaten, which is common,” Ferretti says. However, this only occurs if the male attempts to mate with a female without courting her first, that is, entering her burrow too soon or doesn’t leave fast enough after mating. Although, luckily enough for the males, mating leaves the female immobile for a small amount of time, allowing the male to get away if necessary.